Work on it for 25 minutes. This is called a Pomodoro. Take a 5 minute break. Do something totally unrelated to your work. Work for another Pomodoro, or 25 minutes. This can be on the same task, or a new one if the previous one is finished. After 4 Pomodoros, take a longer break of 15 to 30 minutes. Because of the breaks, your mind gets just enough rest to stay focussed. Also, because you’re supposed to work on one task, and one task only during your Pomodoro, the quality of your work can go up. Ofcourse, the technique is completely customizable. Do you think 25 minutes is too short (or too long)? Try 45 minutes (or 10 minutes). Do you need a long break sooner? Do it every 3 Pomodoros. No I’ve made my own Pomodoro tracker. It’s written in Java 8, and it’s open source. You can find the source here . A runnable version can be found here. This is still work in progress, and I mainly made it as a challenge to myself. If you like it, do whatever you want with it. 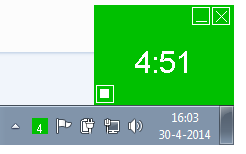 When the screen and the tray icon are red, a pomodoro is running. Right clicking the tray icon will bring up a menu. When the screen and the tray icon are green, you are on a break. Waiting for the next Pomodoro to be started. 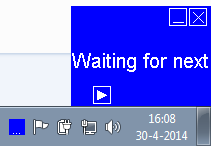 When the screen and the tray icon are blue, the program is waiting. 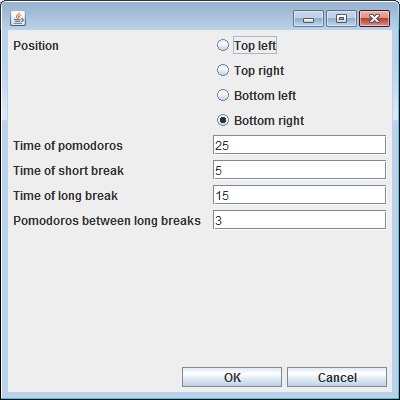 The settings allow you to specify the location of the program, the times and the number of Pomodoros between long breaks.